While camels can drink as much as 32 gallons of water in less than 15 minutes, the humps on their backs do not hold H2O. Instead, the animals store fat in their odd-looking protrusions, enabling them to traverse the desert for days when food is scarce. Camels can survive a week without drinking water and several months without eating. An adult camel can store up to 80 pounds of fat in its humps. When the animals tap into the stored nutritional fat, the humps decrease in size and slump to the side. They become upright again after the camels eat and sleep. The dromedary camel has one hump while the Bactrian camel has two humps. The reason why camels store fat on their backs and not throughout their bodies may be because the humps are used for insulation and to protect the animals from solar radiation, according to Lunds Universitet in Sweden. Fat conducts heat more gradually than water. Dromedary camels have thick fur on their backs to protect them from the sun’s heat, while the fur is thinner on other parts of their body, allowing heat to escape. Camels drink a lot of water when they are dehydrated, but they do not store water to use later on. Their bodies are built to conserve liquid. They urinate infrequently, and their pee is very concentrated. A camel’s droppings are also very dry. Camels have the ability to function with body temperatures over 104 degrees Fahrenheit, and they don’t sweat or pant like other animals, who lower their temperature by using water from their bodies. Camels cool down at night when temperatures drop. The desert-dwelling animals aren’t impervious to the heat, but they can lose 30 to 40 percent of their body weight in water and still ward off dehydration. In addition, the mammal uses the air that it inhales and exhales to create water vapor. Whatever you do, try to avoid being spit on by a camel. Their spit is a mix of saliva and the contents of their stomachs—basically, vomit. They spit when threatened, and the telltale sign is puffy cheeks (so get out of the way!) They also have powerful breath because they regurgitate their food like cows. Camels also have other interesting abilities. Their super-long eyelashes and inner eyelids protect their peepers from desert sand. They can also close their nostrils to prevent sand from entering their bodies. Camels are vocal animals who make lots of noises and make various gestures with their heads, necks, ears, and tails to communicate with the herd. They also blow into each other’s faces as a way of greeting one another. Baby camels are born without humps. 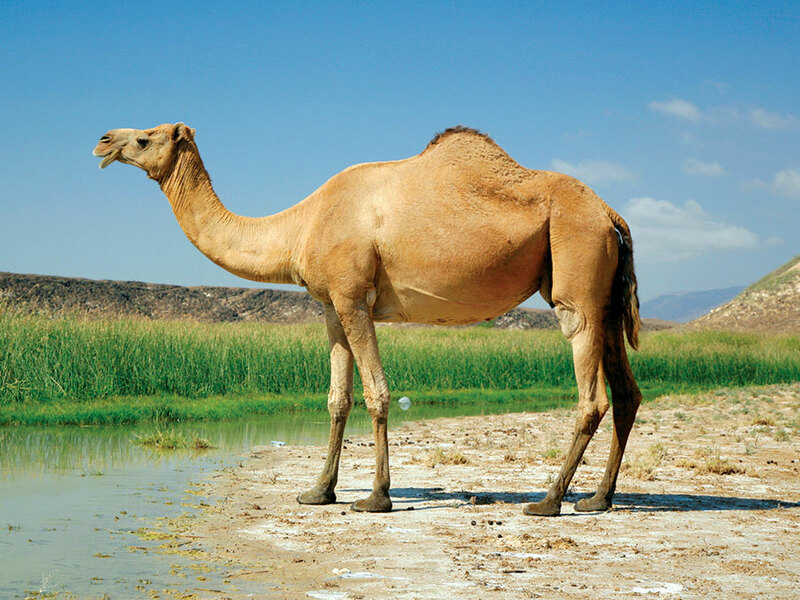 Two-humped camels are critically endangered. One named Zehra was born at the Toledo Zoo in Ohio in 2018 and was the first Bactrian camel to be born in captivity in recent history. This species of camel is indigenous to Central and East Asia, and there are reportedly just under 1,000 currently in existence.